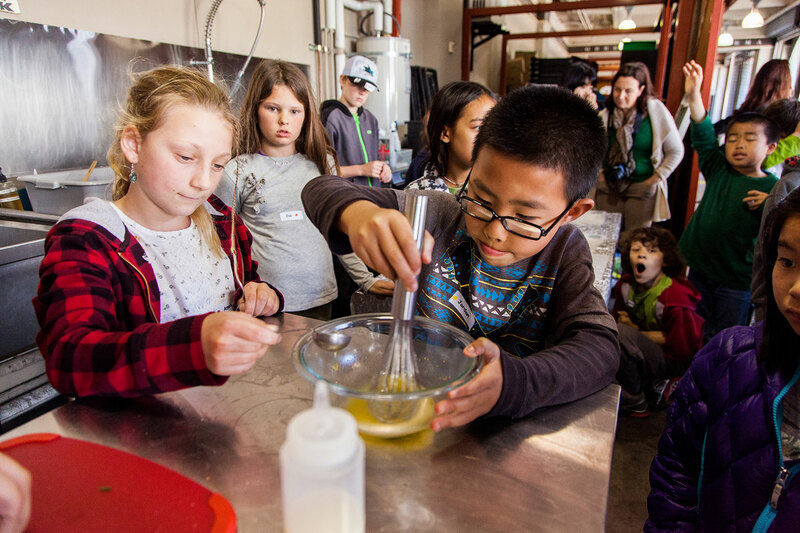 Each fall at CUESA, “back to school” means back to the kitchen for Foodwise Kids, CUESA’s free farmers market field trip and cooking class program for elementary school students. Parents may be tentative about giving their kids access to the kitchen, but with close supervision and guidance, those early cooking experiences can having a lasting impact, inspiring children to love cooking and healthy eating, while building their confidence. 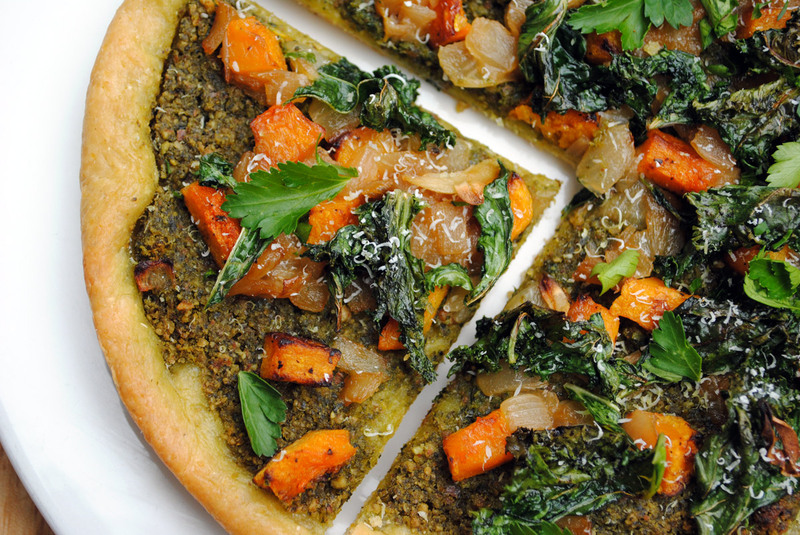 Get the whole family involved in shopping and cooking with fresh local ingredients! Cooking with children teaches skills that will serve them for life. Feel confident working with kids in the kitchen using our tips and seasonal recipes. This guide was created by our team at Foodwise Kids. We we hope that the lessons that children learn during their time with us whet their appetite for cooking with their families at home. Expose children to the entire process of a meal: selection, preparation, cooking, eating, and clean up. Teach them from start to finish on the same day, or break it up. Write a grocery list together. Have your child check on pantry and fridge staples to add to the list. If you plan to cook a familiar dish, have your child list the ingredients they remember eating in the dish. Shop with your child. Ask your child to select produce and have them cross off items from the shopping list. We would love to have your family visit us at the Ferry Plaza Farmers Market or Mission Community Market in San Francisco, or Jack London Square Farmers Market in Oakland. Hours and directions can be found here. A note for familes on a tight food budget: Many farmers markets, including CUESA’s markets, accept EBT (CalFresh/food stamps). During market hours, customers can use their EBT card at the CUESA Info Booth to receive market coins. EBT shoppers can double their food dollars (up to $10 per market day) through our Market Match program, which offers free market coins redeemable only for fruits and vegetables. Review receipts from shopping trips. Reading a receipt can reinforce math lessons and teach basic budgeting skills. Read a recipe together and have your child gather the ingredients and tools before cooking. Teach them the names of kitchen tools. Have your child assist you in the kitchen when you are cooking. Kids can practice knife skills under your supervision. Other tools we recommend using with young chefs: box graters, measuring cups and spoons, peelers, whisks, and their hands! Teach knife safety skills. You can find kid-friendly knives online, or have them practice with a butter knife. Show your child how to grip the knife in one hand, while using the other to hold onto food. In Foodwise Kids, we teach kids to use the “claw” and the “tunnel” to keep fingertips safe. Also teach them to be conscious of where they place the knife when they put it down. We teach kids to always place it back on the cutting board, point facing away from them. Have children practice making a knife with their hand, with the fingertips as the point. Instruct them to always keep the pointy side down, having them show you with their fingers before handing them a real knife. This will help reinforce the information. You can also have them practice keeping the “knife” on the cutting board when they are not using it, as well as keeping it low and close to the surface they are working on. Another safety tip is to instruct children to always “hand with the handle” and practice passing a real knife (or scissors, or a carrot!) safely between the two of you. Know what your kids can do. For younger chefs, you may need to prepare the ingredients before handing it to them to finish. If your child shows responsibility and safety with a tool, have them graduate to a harder tool and skill. Let children be “in charge” of something. Try to pick something they will definitely succeed at. This gives them a sense of responsibility and capability when they complete their task. With younger kids, see if they can help you with tasks that involve less cutting, such as removing tops of tomatoes, plucking grapes from stems, tearing leaves of herbs, mixing, shaking in spices, or pouring. Praise often and be patient! There are no mistakes in a good experiment. Praising children often will encourage their confidence in the kitchen. Encourage exploration and open-mindedness in trying new things, but forcing kids to eat things they don’t like can backfire. We ask them to be brave and give everything one chance. Here’s a trick: Give everything a lick. If the lick isn’t bad, go for a bite. Taste throughout cooking. Taste at the start and at the finished dish, and ask them to describe the differences. It’s also helpful to investigate foods using the five senses. Ask your child what other senses besides taste we can use to explore our foods, then practice with something you are cooking. This is often fun and helps foster curiosity and appreciation for new foods. Have fun! Take pictures and video the process. Talk afterward about how you would change the recipe and which were their favorite parts of the process. Introduce your child to a new fruit or vegetable each month. The farmers market is a good place to find uncommon produce. Try it raw, or prepare the food in several different ways and see which one your child likes best. Browse our searchable recipe database for preparation ideas. If you’d like to take the cooking lesson deeper, consider learning what the plant looks like that your food comes from. This can be a trip to a neighborhood community garden or nursery, or just doing a bit of research on the internet for images of plants. Often kids (and adults alike) are fascinated by what food plants actually look like. This exercise also teaches basic botany: What part of the plant do we eat with each food? Older children can explore further: Where does the food come from? What are some fascinating facts? Are there other recipes we can create with it? We offer handy seasonality charts for fruits and vegetables to guide your ingredient decisions. We always suggest reviewing recipes with your child before beginning. 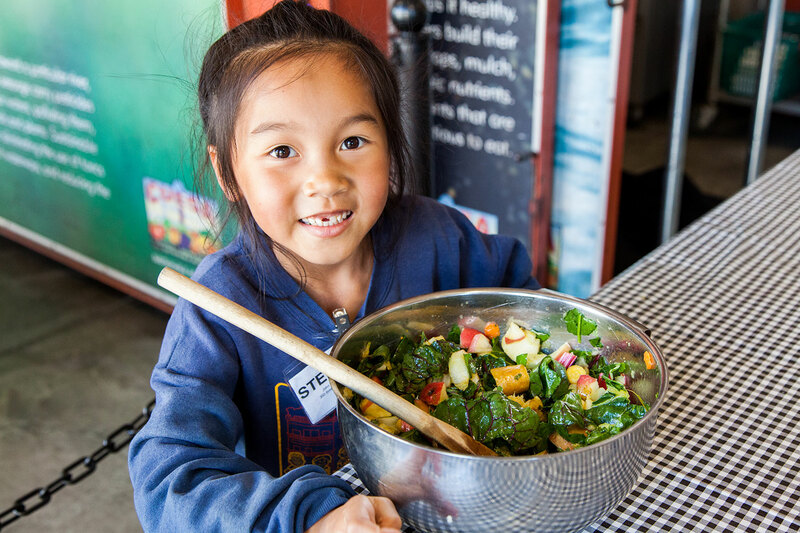 Here’s a selection of kid-friendly recipes that use farmers market produce, developed by CUESA’s Foodwise Kids team. Photos by Amanda Lynn Photography, except recipe photo by CUESA.